Okay, you Brownstone Dwellers of Brooklyn, New York, we have decided to write about your roof top problems. Several of you had contracted us to help make the proper decisions to solve leaks, and for that, we are all fortunate. We repair chimneys and install new flat roofs. 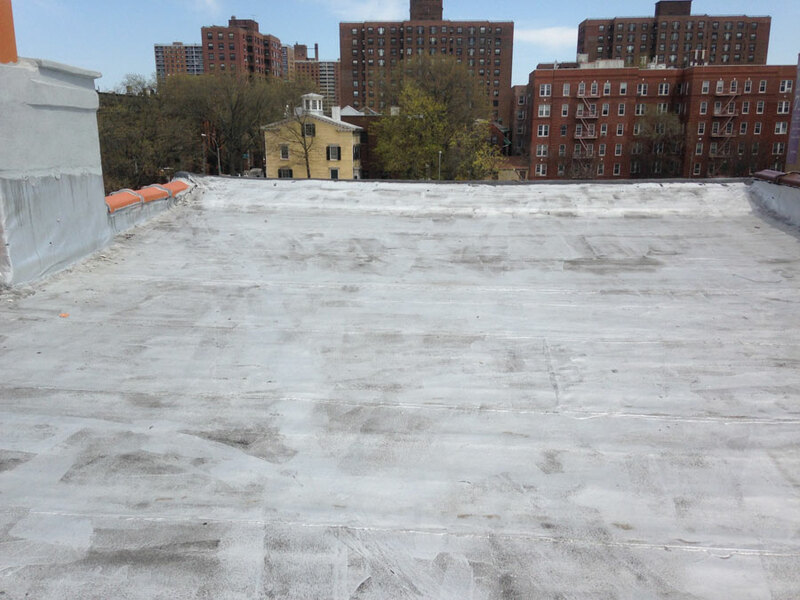 We repair any leaky roof and fix drains in Queens, Brooklyn, and Manhattan. As we think back on our assessments of the problems and needed repairs of the Brownstones listed above, we felt it necessary to mention that any work done previous to our arrival, was improperly done; by inexperienced roofing contractors, perhaps. It has been our experience that not every roofing company has an interest in installing the kind of roofing system needed for long term leak protection, and many of the leaking issues we found were a reflection of that. To include a positive, however, the best thing that all these Brownstone dwellings had going for them, was that the Modified Bitumen torch down membrane roof system had been installed. It is by far, the best 2-ply rubber roof to have on any residential or commercial flat roof. Brooklyn, NY has Brownstone and Brick buildings. All the flat roofs are slightly slanted to the back with either a drain or gutter system. The picture above shows a roof after we installed a new membrane. Notice the parapet walls are covered with the rubber membrane. Also, we were careful to transition the membrane from the roof to the chimney. In the video below, you will see a hoist we made specifically for getting materials to the roofs of Brownstones. On several dwellings, we would only have to prepare the seams to be re-welded, which meant a big savings for the dwellers. On Decatur Street, a brand new membrane was installed only a few months prior to our arrival. To everyone’s distress, vents had to be relocated, so there would be a need to cut new vent openings, with patching repairs made to the old ones. Fortunately, the decision was made to replace a months old roof with a brand new roof so as to maintain the integrity of a one time replacement. Above is a chimney in Manhattan, NY. The tar that covered cracks in the chimney dried up and began to flake off. The best solution was to cover the chimney with a rubber membrane. A close up shot of what happens if you cover the chimney with tar. If you are a Brooklyn resident, you most likely have a Brownstone apartment. If you are having leaking issues, or just need a new roof, you should not remove the existing roof, rather, the installation of a new Modified Bitumen rubber membrane over it, is best. We also advise that the 2-ply membrane with ceramic granules embedded for ultraviolet sunlight protection on the surface, to be your first choice. There was no mistaking the number of roofs we saw painted with the silver coating, which only lasts a few years as protection from harmful sunlight. Currently, there are laws against using a torch to install new roofs, but not to repair one; it is best when 2 torch down membranes are fused together. It becomes a reinforced 2-ply membrane able to withstand the elements for many years to come. This is a chimney in Manhattan, NY. The tar that covered the chimney dried up and started to flake off. We removed all the loose tar and then covered the entire chimney with rubber membrane. The most important part of a roof is the flashing. 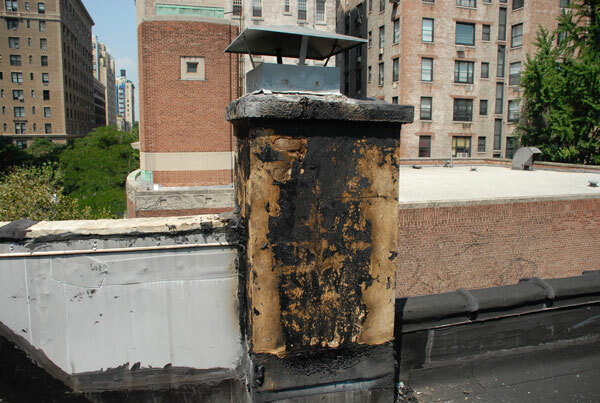 On most of the roofs we have seen in Brooklyn, the roof membrane stopped at the bottom of the wall and then tar was used to make the transition to the parapet walls and chimneys. This is a bad method. In no way should tar be used to cover a cement or a brick wall. The best way to combat leaks that come from these transitions at the chimney and walls, is to continue with the rubber membrane up and over the wall. Most of the chimneys in Manhattan and Brooklyn are smeared with tar. When the tar cracks, water will seep into those cracks. During the winter, the water will freeze and cause the mortar and the brick to crack making it vulnerable to leaks that will come with the first thaw. When it comes to parapet walls and chimneys on a brownstone apartment, the best way to repair them is to cover them with a rubber membrane. This chimney is in Brooklyn. The flashing seal failed which caused leaking. Working on a chimney on Clinton Ave., in Brooklyn, New York. The modified Bitumen membrane sounds much sturdier than tar. Flat roofs seem to have lot of problems, but you guys seem to know how to keep those issues to a minimum. Thanks for the info! Never in my wildest dreams did I imagine writing a positive review about a roofing company. However, Commercial Roof USA is so deserving of praise. I live in a Brooklyn Brownstone apartment with a flat roof that has been leaking. Multiple prior roofers evaluated the leak and a new roof membrane was placed, however, the problem persists. To make things more complicated there is now a roof deck above the new roof membrane. Desperate to find someone that could help me find and repair the leak, I scoured the internet and came across Commercial Roof USA and Naas Ferreira. They had previously received wonderful recommendations in the Brownstone forums. I spoke with Naas directly. He could not have been more helpful on the phone and made it clear he was always available. His business is family owned. He sent his sons Erik and Sven to check my roof. They could not have been nicer, more professional or more honest. Erik crawled around under my deck and evaluated every inch of the roof to look for problems. He found several spots on the flashing of the new roof that were the likely culprits. Needless to say, this job would have been much easier if there was not a roof deck, but Erik was determined to do all in his power to not damage anything unnecessarily. More work will be needed, but I won’t let any other roofer near my roof deck other than Naas and his sons. It is such a breath of fresh air to see a small family business maintain such high standards and be so successful. Congratulations and thank you Naas and family at Commercial Roof USA! We would be happy to assist you in the future. It was a pleasure to serve you.